Relax and start your brain workout with this smart and addictive puzzle game. 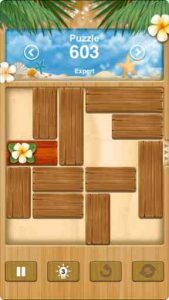 Exercise your mind with more than 18000 unique puzzles, the highest amount of puzzles you’ll find in any game! With many Million downloads already, you can’t go wrong with this super addictive puzzle game. Unblock Me is a fun and addictive puzzle game. The goal is to unblock the red block out of the board by sliding the other blocks out of the way, unblock it with the minimal moves. Unblock Me comes with 5 difficulties ranging from Starter Pack to Expert. There are more than 18000 puzzles in total, worth hundreds of hours to keep you challenged and addicted. Please include the app’s version, your device information, and a screenshot if possible.